The bicycle route along the Mura runs directly next to our hotel. The bicycle route along the Mura leaves from the village Muhr which is 40 kms from Murau. This 40-km section is ideal for a whole-day bicycle tour. Let beautiful Murau be the first stop of your tour and be our guest at Hotel Alpin Murau! Would you like to ride on the full length of the bicycle tour along the Mura and spend only one night in Murau, at our hotel? No problem, we are looking forward to seeing you! 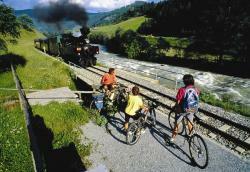 You can go on a light, family friendly bicycle tour on this train starting from Murau. Sportier people can travel from Murau to Tamsweg, then cycle to Unzmarkt (65 km) and then return to the hotel by the small train. Those preferring easier tours can choose the Tamsweg-Murau (37 km) or the Unzmarkt-Murau (28 km) section for a day. For half-day tours choose a station closer to Murau, e.g. Stadl an der Mur (17 km) or Teufenbach (17 km) in the opposite direction. You can make nice rounds along the bicycle route without the small train, starting from Murau. 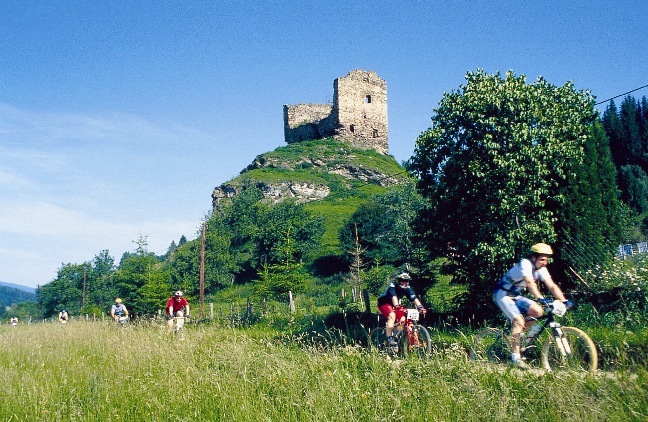 Sights: ruins, castles (Ramingstein), medieval town of Murau, museums (Wood Museum, Beer Museum) and the wood architecture masterpieces of “Styrian Wood Route” along the bicycle route. We await bicycle tour organizers as well as individual guests! 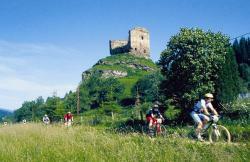 Discover Styria by bike from the high mountains to the wine regions! This bicycle route leads you along Styrian village yards, made even more colorful by ruins and castles in the most beautiful Styrian areas to the thermal baths in Southeastern Austria. The route is mainly downhill with slight steeps on the initial section when the road bends away from River Mur.